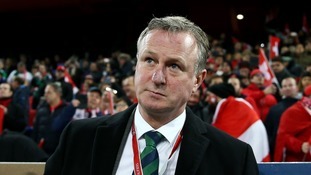 Northern Ireland boss Michael O'Neill wants the Football Association of Ireland to be more transparent over player eligibility, having become increasingly irked at losing youngsters to the Republic of Ireland. The likes of James McClean, Shane Duffy and Darron Gibson have all exercised their right to play for the Republic's senior team having represented Northern Ireland at youth-team level. O'Neill sparked a row last week with comments published in the Irish Daily Mail in which he claimed the FAI "only ever" targets Catholics to play for the Republic. O'Neill, himself a Catholic, issued a statement on Tuesday in which he denied attacking the FAI but also rebuked it for the way it acquires players via an eligibility transfer. "Contrary to how it has been reported, I did not attack the FAI, I merely responded to the questions I was asked," O'Neill said. "For me, eligibility is not, and should not, be a political issue. Nor should it be a religious issue. For me, eligibility is a football issue." He added: "The FAI correctly states it has broken no rules in approaching young Northern Ireland players requesting they switch allegiance to the Republic of Ireland. My concerns lie specifically with players aged 17-21 in the under-age set-ups. "I've seen a heavy price paid by too many talented young players; players who have transferred their allegiance to a country that ultimately doesn't rate them, nor play them - creating an international vacuum for the player that signals a wholly different outcome to the career that they may have had. "My request therefore, to the FAI and to any other association, is this: that if a young player has chosen to represent Northern Ireland at under-17, under-19 or under-21 level, that he is allowed to develop in these crucial formative years without the responsibility of having to make a decision regarding his international allegiance that is binding for the rest of his career. "My request extends to any country, not just the Republic of Ireland. "Where I am critical of the FAI is the way in which it currently communicates with the IFA (Irish Football Association) over a player who potentially wishes to make a transfer. "There is no dialogue with our coaches from their respective counterparts at the FAI besides an email from the FAI's licensing department requesting information on the player." Last week Republic of Ireland boss Martin O'Neill, a former Northern Ireland international, expressed surprise at his counterpart's initial comments while also calling them "disappointing" as he explained he had never taken a senior player from him. However, Michael O'Neill insists his gripe centres on youngsters. "I have been asking my counterpart at the FAI for a meeting to discuss these issues for more than eight months," the Northern Ireland boss added. "I am pleased that he indicated last week that he is now willing to take me up on that. It is clear to me, given the examples that Martin used in his press conference, that he misunderstood the issues that I wish to address. I am not talking about senior players but those aged 17-21 born in Northern Ireland." QPR's Paul Smyth has not been included in the senior squad to face South Korea later this month, though Michael O'Neill insists he will remain with the under-21s amid fears he could be the next to defect to the Republic. There is also no place for West Brom's Chris Brunt as the 33-year-old is taking a break from international football, while Wigan's Will Grigg will concentrate on club matters. Veteran defenders Aaron Hughes and Gareth McAuley, both 38, have both been included, as have uncapped duo Conor Hazard and Jamal Lewis. Full squad: Michael McGovern (Norwich), Trevor Carson (Motherwell), Conor Hazard (Falkirk); Aaron Hughes (Hearts), Gareth McAuley (West Brom), Jonny Evans (West Brom), Craig Cathcart (Watford), Conor McLaughlin (Millwall), Lee Hodson (Rangers), Paddy McNair (Sunderland), Jamal Lewis (Norwich); Steven Davis (Southampton), Niall McGinn (Aberdeen), Oliver Norwood (Fulham), Corry Evans (Blackburn), Shane Ferguson (Millwall), Stuart Dallas (Leeds), Jordan Jones (Kilmarnock), George Saville (Millwall); Kyle Lafferty (Hearts), Josh Magennis (Charlton), Conor Washington (QPR), Jamie Ward (Cardiff), Liam Boyce (Burton).